The TouchScreen Thermostat Series offers models suitable for conventional heating systems & renewable heating, electric floor heating and a low voltage series that is specifically designed for integration with third party home automation systems. 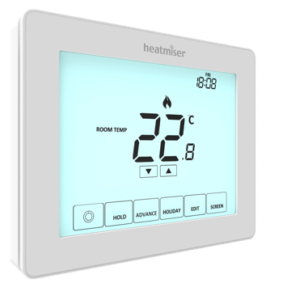 The Heatmiser Touch is a 230v powered TouchScreen Thermostat and is the ideal upgrade route for those with an existing mains powered thermostat. The Touchscreen interface and flexible programming allow for tighter control of your heating. The Heatmiser Touch-e is our touchscreen electric floor heating model, capable of switching up to 16A and the touchscreen interface makes interacting with the heating system easy. A 3M remote floor sensor is provided. The Touch Series offer optimum start, a feature were the thermostat calculates the amount of heat up time required. The Touch-E is our programmable electric floor heating model, capable of switching up to 16A. A 3M remote floor sensor is included. Key locking is standard on all of the Touch Series and is an excellent way to reduce tampering of the heating system. The Touch Models can be set to work in Non Programmable, 5/2 Day or 7 Day Programming ensuring that you can select the right programming choice for your requirement.